The Stock Market Crash that ushered in the Great Depression was the second of the one-two punches that hit the fortunes of Broadway at the end of the 1920s. When talking pictures became a practical reality in October of 1927 with Warner Bros’s The Jazz Singer, the entertained world was revolutionized and Berlin’s work was front and center. In one important scene, when Al Jolson sings to his mother in the picture, demonstrating how he can “rag” a song in vaudeville, he performs Berlin’s “Blue Skies,” written the previous year. Like many Broadway songwriters, Berlin found a brand-new portfolio full of opportunities offered by the Hollywood musical: movies could now provide song and dance; the finances of Broadway were diminished by the Depression; and the Hollywood climate was far preferable. 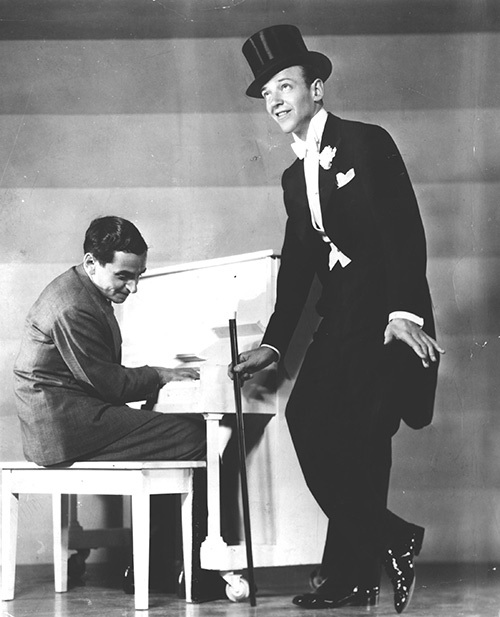 Between 1928 and 1930, Berlin wrote several “theme songs” for various films, including “Puttin’ on the Ritz” and “Marie (The Dawn Is Breaking).” His first full score for an ambitious musical film, Reaching for the Moon (1930), ended in dismay when all of the songs, with one exception, were cut out of the film before its release by the producers at United Artists; the initial vogue for sound musicals had quickly faded due to limited camerawork and poor sound recording. Luckily, technology had improved by 1935 and Berlin was lured back to Hollywood to score Top Hat, the fourth screen appearance by the legendary team of Fred Astaire and Ginger Rogers. 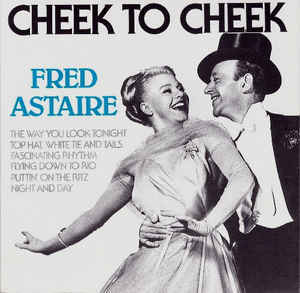 Five Berlin tunes appear in the final picture - each of them beautifully crafted to the dancing talents of Astaire and Rogers - including “Cheek to Cheek” and “Isn’t This a Lovely Day?” Top Hat was the biggest financial success of all the Astaire-Rogers films and is considered to be one of the most enduring (and endearing) films of the 1930s in any genre. Berlin would score two more films for the team: Follow the Fleet (1936; “Let’s Face the Music and Dance”) and Carefree (1938; “Change Partners”). In addition to burnishing the screen iconography of Astaire and Rogers, Berlin displayed his knack for screen innovation with a Technicolor dream fantasy for the film Carefree which would use the tune of “I Used to Be Color Blind” (alas, the technology was not equal to his imagination and the sequence was filmed in black-and-white). In 1937, 20th Century Fox produced the first of many Berlin “omnibus” films to reach the screen: On The Avenue, a showbiz comedy that showcased several new Berlin songs (“I’ve Got My Love to Keep Me Warm,” “This Year’s Kisses”). It was followed by Alexander’s Ragtime Band, an epic musical romance that contained 29 Berlin songs, two of which were new (including “Now It Can Be Told”). Berlin contributed songs to a variety of Hollywood musicals over the next two decades, most of them set in some sort of show business venue, nearly always mixing previous Berlin standards with new numbers: Second Fiddle (1939; all original songs), Holiday Inn (1942; “White Christmas”), Blue Skies (1946; “You Keep Coming Back Like a Song”); Easter Parade (1948; “Steppin’ Out With My Baby”), White Christmas (1954; “Count Your Blessings Instead of Sheep”); and There’s No Business Like Show Business (also 1954). A long-planned anthology/biography with songs, old and new, by Berlin, entitled Say It With Music was developed by MGM throughout the 1960s with a variety of possible musical stars, but it was never made. In addition to The Cocoanuts, four of Berlin’s stage musicals were filmed by Hollywood. Berlin’s voluminous screen output included seven Academy Award-nominated songs, with “White Christmas” winning the Oscar for Best Song in 1942.